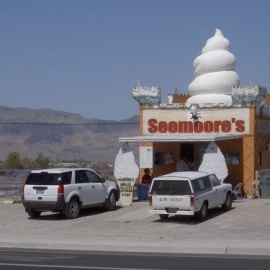 We are Pahrump's original and favorite Ice Cream Stand. We serve 3 flavors each of the best soft serve ice cream and yogurt in town. Vanilla and Chocolate Ice Cream and Vanilla and Strawberry Yogurt are always available. We also have 2 "Special' flavors that change weekly. A small chocolate ice cream has less than 120 calories and only 3g of fat. A small yogurt has less than 110 calories and only 2.5g of fat. We even cater to dogs with our special "Doggy Sundae"